A regional publisher has unveiled a new top team following the departure of one its editors after less than seven months in charge. Rob Bruce, pictured left, of the Glasgow Evening Times, has taken voluntary redundancy from the Newsquest-owned Herald & Times Group to pursue opportunities outside of journalism. He is understood to have left as part of a rolling restructure first announced in August last year, which put between 18 and 20 roles under threat across the group’s four daily and Sunday titles. Rob’s predecessor Tony Carlin’s departure was announced in October as part of the same restructure, while Richard Walker left his role as editor of the Sunday Herald and The National at around the same time. 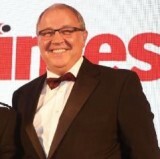 Graham Shields has now taken up the editorship of the Evening Times, having previously served as group head of sport since September. He had also held several other roles across the Herald & Times group during the past 18 years – including sub-editor, sports production editor, deputy sports editor and assistant editor. Several other changes to the group’s senior editorial team have also been announced since Rob’s departure earlier this month. Graeme Smith has been promoted from senior assistant editor to deputy editor, replacing Barclay McBain, while Garry Scott has taken on Graeme’s senior assistant editor post. Thomas Hawkins has also taken on an assistant editor role within the group. In other changes, Gary Keown has become sports editor, Lindsay Archibald has moved from the Daily Record to become group digital editor, while Deborah Anderson and Carolyn Churchill have become deputy news editors within the group. Eyes down for Regional Press BS/dejavu bingo! ..pursue opportunities outside of journalism. Yet another all too common and very familiar sounding piece about life at the top(ish) in the uk regional press and one which we will continue to see on a very frequent basis throughout this year. Good luck to all those “persuing opportunities outside of journalism” though in my experience most of them come back “within” journalism quite quickly for local independent publishers and not in the killing fields of whats left of the traditional uk regional press. “This is a really strong team and we’re now in the best possible position to tackle the challenges that lie ahead.” This is a pretty heartless comment as it clearly implies the company wasn’t in that position when Mr Bruce – who seems to have a wealth of relevant experience – was part of the team. Bah humbug! Best of luck with that career “outside of journalism”, sir. I’ve only read four paras of this story and already am loving it…”a rolling restructure”…”pursue opportunities outside of journalism”…”a top new team”….ohhh! It just needs a comment from Mr Minim and it will be the icing on the cake. Sunset: bringing you your icing is my one joy in life… oh, and considering a career outside journalism. Prospector – if you were ‘made redundant’ and had the choice of using one of the terms you mention. You would have chosen one of those. Unfortunately us minions don’t get the choice. Nobody wants to be tarnished with being given the boot. I avoid mentioning it, just say I went freelance after 10 years of doing the same thing that got boring. I would write more, but I’m off to do a freelance job now, half a day for £250. Who misses it, not me!! In that case, my former employers gave me all the encouragement in the (Local) World to further my career outside regional newspapers. Okay. This has stopped being funny now. It’s not just Trinity Mirror doing the ednapping..
Who’s taking all these editors, and where are they being stored? Sometimes, stuck in a crap journalism job putting out a paper you are increasingly ashamed of , it is hard to believe there is life beyond. But believe me there is. More respect, better conditions. Being made redundant by JP was unpleasant, but even later in life I managed to hunt down a better job. Good luck to this guy. It’s not Rob using the phrase it’s the PR spin merchants trying to put a happy cheery rosy cheeked gloss to this chap being laid off ,for cut it as you like or call it what you will that’s what’s happened. Maybe I’ve missed it but we never hear of HR staff, junior ad managers,middle managers or those with pompously grand commercial job titles yet who produce nothing of value to the company being put into ‘ the consultation process’ or encouraged to go ‘perusing opportunities outside of publishing’ do we? I know this is primarily a site for journalists but it would be interesting to see if there is another side to this constant culling of editorial staff or whether it really is just a one sided affair. Cue rabid old ad reps foaming at the mouth to tell us how easy we have it and how what we don’t add no money to the kitty. “We’re now in the best possible position to tackle the challenges that lie ahead,” said the captain of the Titanic. Q: Who’d be an editor these days? A: There’s always someone, as there always was. Kenny, I’m not going to disagree that these announcements are always editorial/production heavy but I think that sometimes the Ad-Reps are not replaced when they leave. Meaning their reduction is not achieved through the uncomfortable process of redundancy and the associated undermining of their skills or experience but through a simple process of not recruiting. Be interesting to find out the number of actual reps (those that generate the rev) and those that manage them! How about a story one day saying “Editor doesn’t stand down” or “Editor tells crap management to shove it”. Meant to say “Dog bites man”. Sorry! That’s fair enough but I can’t say I agree fully @curious, I’m sure some have a non replacement policy but there’s rarely talk of cutbacks and downsizing in the sales departments that I can see. commercial people’s effectiveness can be gauged by their performance y/y and against targets ( though all reps I know claim their targets are unfair) so yes it would be good to see one company take a thorough audit in what each sales persons value is to the business by what they bring in against what they cost to employ: salary,bonus,car etc I think there would be some interesting results and definitely those pushing paper around and producing meaningless spread sheets to fill their days would quickly be identified and the cost savings there alone would make a considerable saving. Any company brave enough? Or is the edit and ad pro axe an easier one to wield? Kenny makes a very good point. Is it only the people with the relevant skills and experience in getting out the profit-making products that cop the flak, or is it everyone, including admin and useless suit-and-tie “executives” who may as well be – and probably soon will be – in the plastic loo seat industry, for example? Curious also asks a good question about ad reps, though they are vital because they bring in the lucre that oils the machine. An efficient, profitable publishing outfit should be a dynamic partnership of editorial and sales – and to blazes with the legions of cost-draining regional MDs and the like.